This page relates to the Reunions organized by Jenny Cowen, one of our cousins in Australia. So far Jenny has arranged two reunions, the first in 2012 and now this year, 2015, with another planned for 2018 – the 200th anniversary of the arrival, in Australia, of Samuel Moss Solomon. Attendance at both has been very good and people have enjoyed meeting new and forgotten relatives. 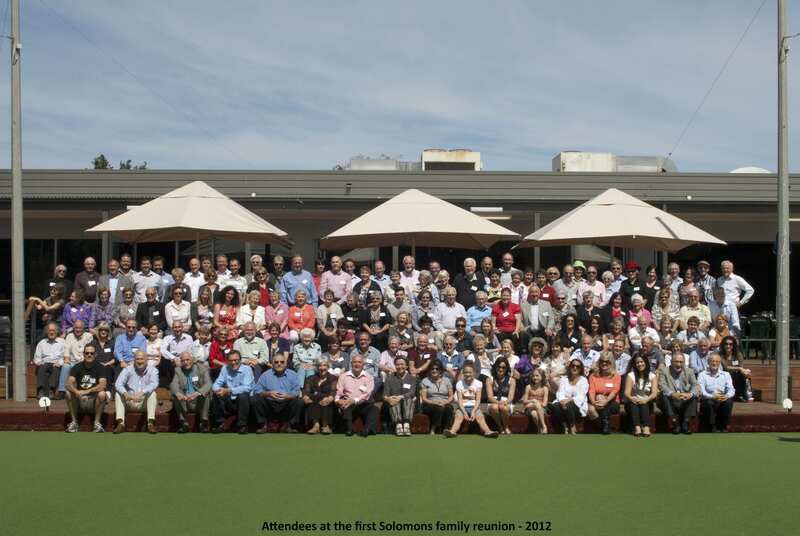 The Solomon reunion was held in Australia. The turnout, which included our own Rabbi Roderick Young was 200 strong and was featured on several TV news broadcasts. The reunion went off without a hitch and cousin Roderick was just the icing on the cake. We had T.V., radio, newspaper and magazine coverage!!! Since all this exposure we have had yet more contact from family and it seems that the Keesing branch of the family, who reside in California, may visit next year. SO we may have another get together. “ We certainly appreciate the financial contribution from the Solomon Family reunion which we will put towards digitisation of the South Australian Chronicle. We are currently having the South Australian Chronicle microfilm scanned and it is scheduled to be OCR’ed to support full text searching and delivered via Trove in the first quarter of the new financial year (i.e. all going according to schedule between July and September 2012). A further $500.00has been donated to the Sisters of St Joseph’s in memory and in continuation of the bond forged between Saint Mary MacKillop and Emanuel Solomon. The funds will be used by the Sisters in their charitable works. Neville Wight, Katrina and I attended morning tea at the Mary MacKillop Heritage Centre and presented the cheque to the Sisters. Also present were the Principal of Mount St.Joseph Girls’ College, Cath Dillon and two of the year eight students, one representing Solomon house. Yes, the house is named in honour of Emanuel Solomon! Solomon house’s motto is “All equal in God’s eyes”. Jenny has already started work on a 200th Anniversary Reunion in 2018. Whilst some people may think that another reunion in 2018 is too soon, I think that we have to take certain factors into account. 200 is a notable anniversary. These reunions appear to be close together only because of timing – I know that sounds obvious, but if Jenny hadn’t arrange the initial ones it is unlikely that there would be the enthusiasm for a 200th. We are all getting older and it may well be the last opportunity for some family members to participate and for others to glean information from them. There is always a new generation that can be encouraged to take an interest. We’ll get the opportunity to meet up with lost relatives and to meet ones you never even knew about. Whilst it is regrettable that I am unlikely to be able to attend, I must thank Jenny for her untiring efforts in both looking after the family tree, and organising the reunions, and to Katrina for supporting Jenny. The database operates the same as most genealogy databases, showing data and relationships. This system allows me to store a variety of data that is not directly part of the genealogy database. The main body of the screen is where selected information is displayed. Use this to search within the WordPress system – all items are indexed and can be searched. Jottings These are extracts from emails that people have sent – useful snippets of information here. This a list of tasks that I currently have planned to do for the website. Please let me know if you have any other ideas that you would like adding. This has been pending for quite a while. The major problem is that some of the maps get quite big and may be a bit slow for people who aren’t on broadband. May just go for it and see who has problems – may have to do a reduced quality version for them. The aim is to add direct ancestors for all the group linking back to Jacobs. Big Tree is now a bit unwieldy. Need to come up with a plan for finding out more about the early Jacobs i.e. Jacob, David etc. Where should we be looking for more information? I have been asked what I considered suitable for publishing on the website in respect of the type of material and how far we would stray from the Jacobs. It took me a while to come up with a suitable answer and having done so felt that it would be sensible to publish my thoughts for others to consider. As most of you know the original aim of the website was to gather together information on our common ancestors, the Jacobs. Whilst we all generally discuss the information, it is available for all to see and I wanted to make sure that what we were publishing was as accurate as possible. These are the people on whom we most anxious to find information. If you have any information about any of them, please let us know, using the Contact Us form. David Jacobs (Litzen)David is the patriarch of the family and as such is of great importance to us. We believe that he may have been born in Lietzen, Germany – hence the name. It is possible that he took the name Jacobs in memory of his father who may have been called Jacob. David was certainly somethion of a character, being in court in several occasions for theft, or attempted theft of ribbon. One case at the age of 75 resulted in him being incarcerate in Newgate prison for 12 months. Last seen age 10, 1861 27 ½ Duke Street, Aldgate London, father Henry Jacobs the Butcher. Do you know this man, did he sail off to the new world countries with your grandmother. If you have a John Jacobs in your family please let us know. Last seen age 19 4/34 Duke Street, Aldgate London, living with his father Henry and sister Sarah Swaebe (nee Jacobs), working as a Butcher. Do you have a Solomon Jacobs in your family, he may have remained in the butchers trade, I have searched high and low for him. I believe he was alive in 1911 as he was left a sum of money in his uncles will. Do you have a kosher butcher in your family? Last seen age 13 and 9, 1901 368 Cold Harbour Lane, Brixton. Father was Julius Susman who owned an auctioneers in Railton Road Brixton and in Clapham. Do you have an Isaac or John Susman in your family tree if so please get in touch now. Last seen aged 28 in 1880 in prison serving 1 month for committing bigamy. Had ‘changed’ his name and was using Alfred Jacobs Beabe on his illegal wedding certificate. May also go under the name of Alfred Michael Jacobs or Michael Alfred Jacobs. Do you know where Michael is? Last seen in 1861 102 Petticoat Lane aged 14, son of Eliza Jacobs a Butcher. Have you seen Aaron, did he travel to South Africa perhaps or one of the other new world countries, would love to find him.